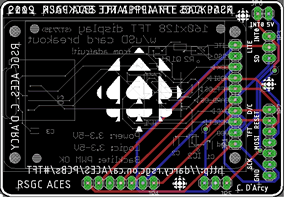 Below is a partial archive of ACES' printed circuit boards. Note. 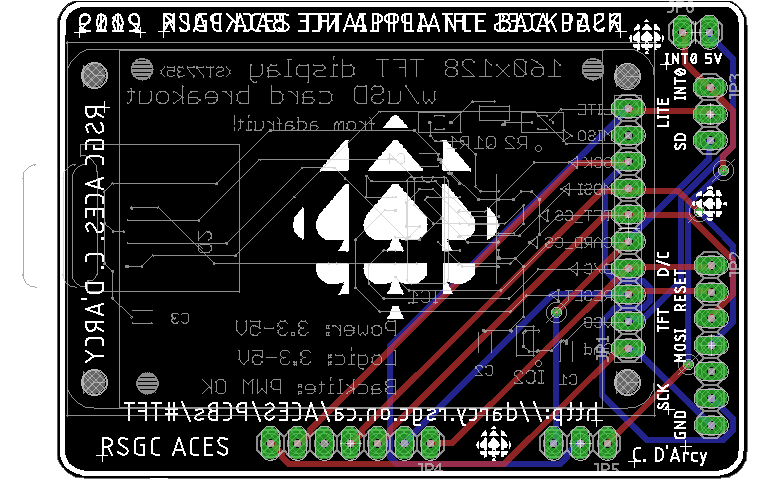 ACES are not the biggest fans of wasting time so we try to design our boards as UNO 'appliances' in which strategic pin locations allow for insertion directly into the UNO's headers. 16×2 Character LCD Carrier. (March 2019). 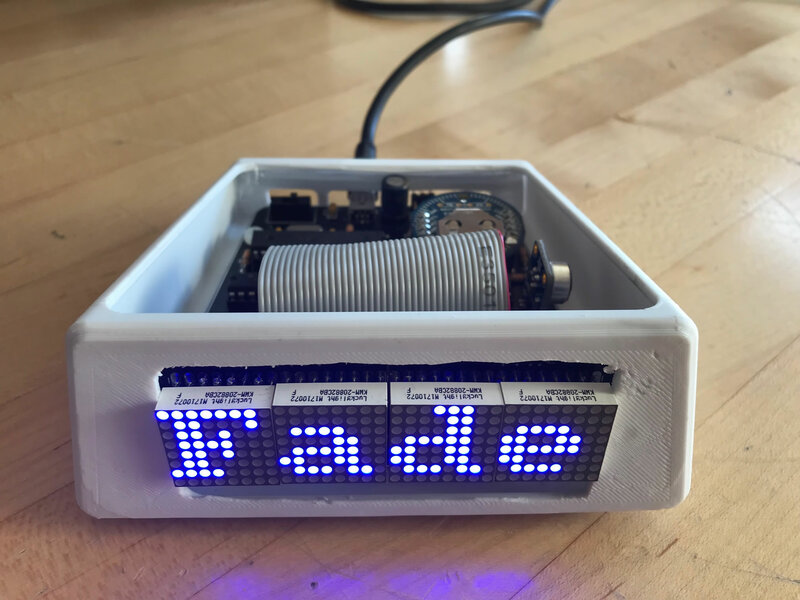 Since the wiring of this useful device is a less-than-desirable undertaking, O/C* coverage of Adafruit's ubiquitous 16×2 Character LCD in the Spring of 2019 necessitated the creation of an ACES Appliance. Standard pinheader and hole placement dimensions were readily available online. After a quick solder and attachment to the appliance the LCD panel should be ready for exercise with the software application developed for the demonstration. 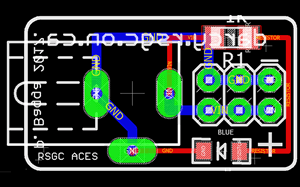 ICS2O Counting Circuit. (March 2019). As dynamic as the ACES curriculum is from year to year, the classic Grade 10 Counting Circuit is a right of passage for ACES. 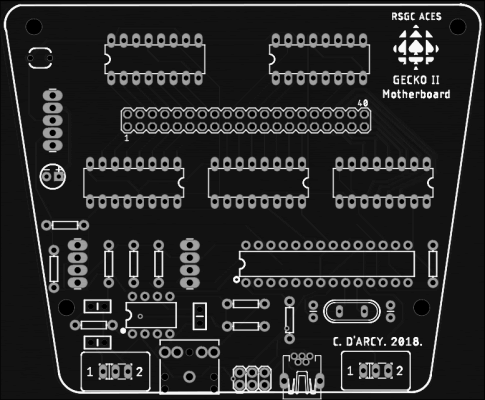 Over the 2019 March Break a custom PCB was designed and manufactured for those ACES that can demonstrate a working breadboard prototype in plenty of time before their DER is due. 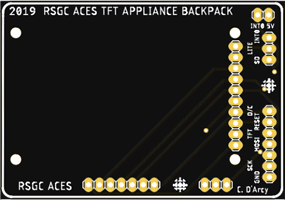 As he kindly did for the ACES Capacitor Visualizer (see below), J. Dolgin (ACES' '20) graciously designed a custom case for this PCB. 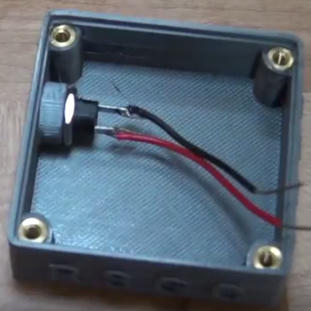 The 9V battery resides in an internal well, centered within the case for balance. 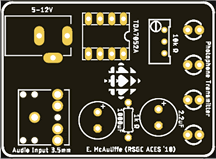 At 4h a print, only those ACES that succsessfully solder their PCBs are in line to receive a case to mount their device! Good luck. Joule Thief V0. 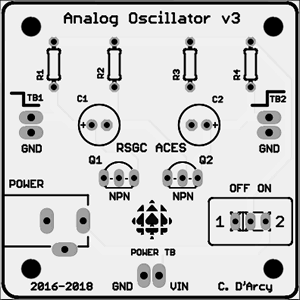 Also known as the Blocking Oscillator, this wonderful little circuit has a charming history and introduces students to the interplay between electricity and magnetism as well as the Persistence of Vision (POV) concept. 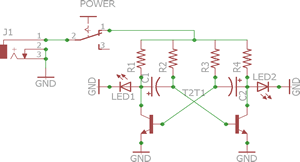 It is at the heart of the ubiquitous solar garden light in that it can boost the voltage of an all but dead 1.5V AA battery to the point that it can drive the higher voltage (~3V) blue and white LEDs. 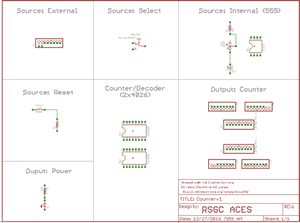 Prepared for ACES use for the first time in the Spring 2019 ICS2O session, I challenge readers to explore the many variations of this fascinating circuit. This particular minimalist variation uses a pair of 100μH fixed inductors in place of a toroid ring and is described in Wikipedia article. 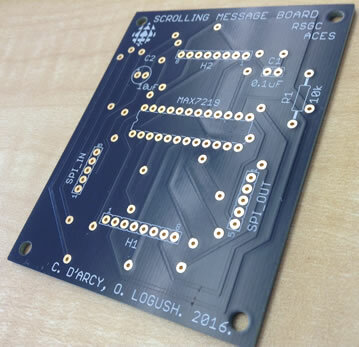 The first ACES project to incorporate this circuit board was assigned in the 2019 Spring session of ICS2O (formerly TEL3M). 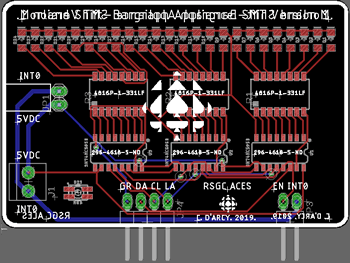 (Appliance) Morland Bargraph SMT V2A (SPI-compatible). 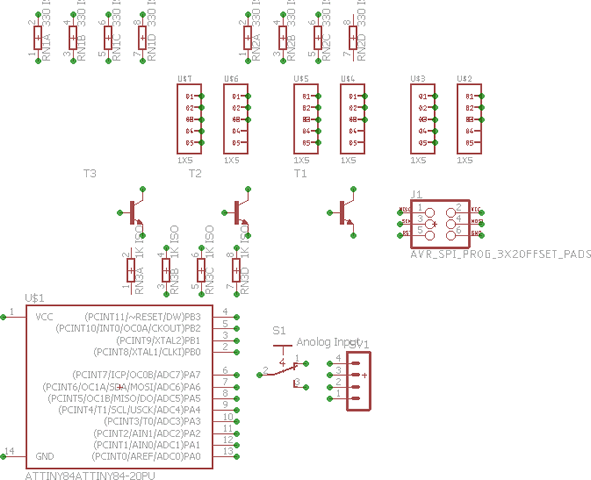 SMT V1 worked as expected but but after realization that the AVR's SPI peripheral (on dedicated pins 10-13) can provide the hardware equivalentof the (relatively slower) software shiftOut function a simple, but significant, SMT V1 update was made to accommodate either transfer strategy. 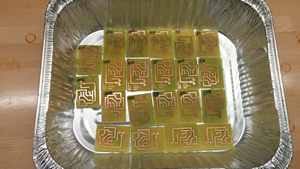 I've order 25, just enough for a class set of these that we'll bake in the Hodgson Reflow Oven in early March 2019. 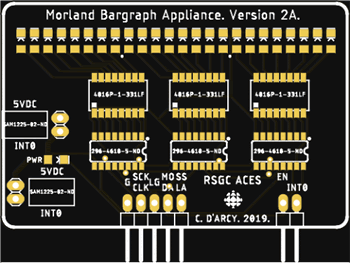 (Appliance) Morland Bargraph V3 (SPI-compatible). Realization that the AVR's SPI peripheral (on dedicated pins 13-10) can provide the hardware equivalence of the (slower) software shiftOut function inspired a simple but significant V1 update to accommodate either strategy. 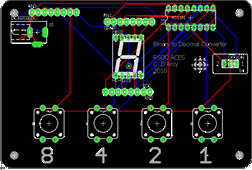 Another subtle redesign consideration was to limit the increased number of pins from 5 to 6, providing the flexibility to implement the device in any of three Arduino (ATmega328p) ports (PORTB, PORTC, or PORTD) to minimize competition for pins with other ACES appliances. 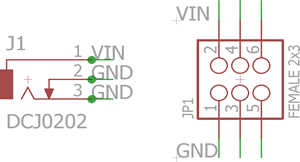 Sourcing power from digital pin 12 (MISO is not required for this appliance) is not ideal, but still an esthetically-preferable solution than running a wire to the 5V pin. 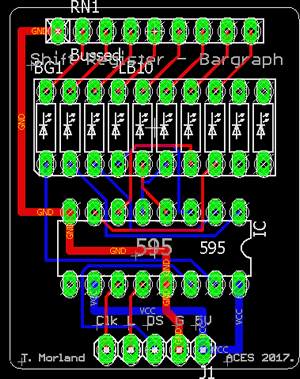 As 8-LED bargraphs (that match the 595's 8 outputs) are not readily available, the bargraph's two leftmost LEDs (MSBs) remain unconnected. 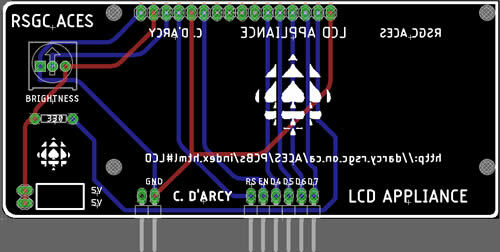 The active 8 LEDs have been changed to right-alignment and small dots added to assist interpretation of the LEDs/bits. The symmetric scalloped corners are cosmetic. White was chosen to enable quick distinction from its V1 counterpart. 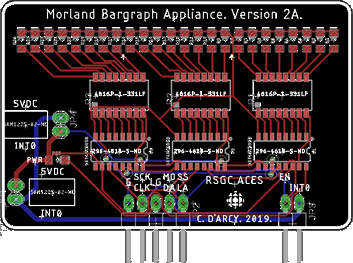 (Appliance) Morland Bargraph SMT Version 1. An SMT version of the essential Morland Bargraph was designed and produced for the 2018/19 ICS4U class. The device worked as expected but a design oversight did not allow for faster hardware SPI transfers. 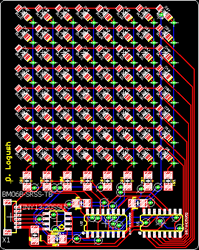 SMT VErsion 2 will correct this issue to make it SPI-compatible. If you have a functional version of this device, download this code and take it for a test drive. 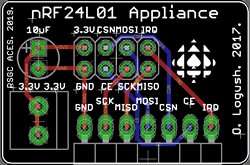 nRF24L01 Appliance. 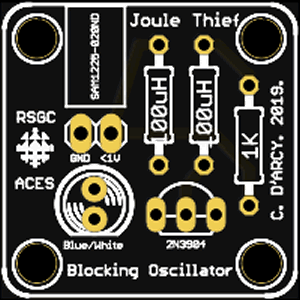 To prepare for the 2019 ICS3U introduction to radio frequency communication a reworking of an earlier 2017 design by O. Logush was undertaken and converted into a UNO Appliance. 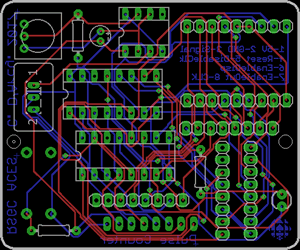 The board breaks out the incompatible UNO pin arrangement of the standard nRF24L01 to a wireless (pardon the pun) configuration. Photophone. One of most remarkable projects from the 2017-2018 Sr. ACES project lineup was E. McAuliffe's (MacGyver-inspired) photophone. It is both perplexing and inspiring in its simplicity. Ethan took a break from his Engineering studies at McMaster over thr holidays to whip up a convenient transmitter and receiver for current ACES to explore and enjoy. Feel free to explore more of Ethan's projects by browsing through his blog. 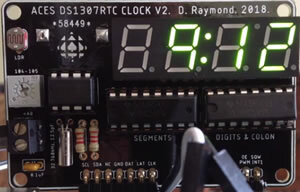 (Appliance) D. Raymond's RTC Clock. 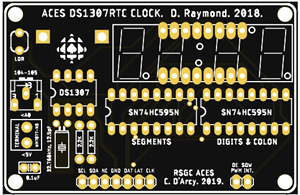 D. Raymond's 2018 legacy PCB was a handy little RTC and display that is used to introduce Grade 11s to the I2C communication protocol. A tweaked version in January 2019 of the PCB was converted to an Arduino appliance. 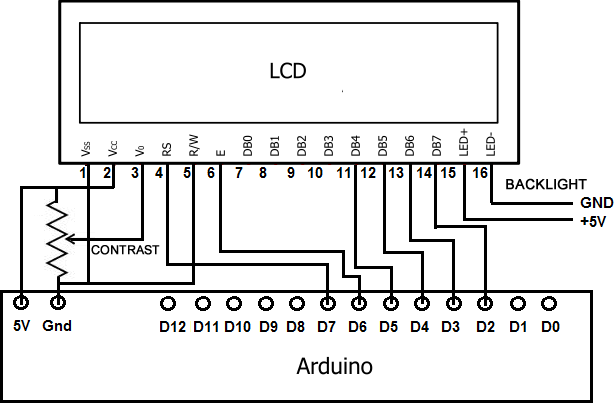 Analog to Digital Converter. 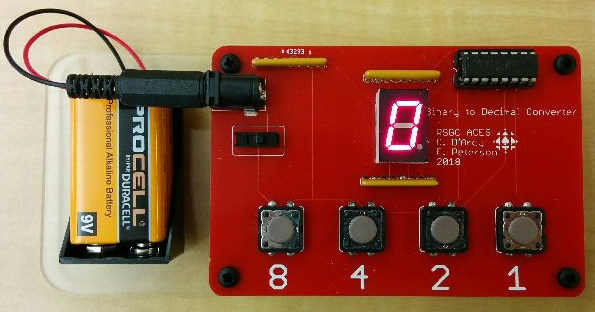 A utility board that could be used by Grade 10s to yield a digital display of 10-bit analog voltage conversion levels levels should prove to be quite useful. 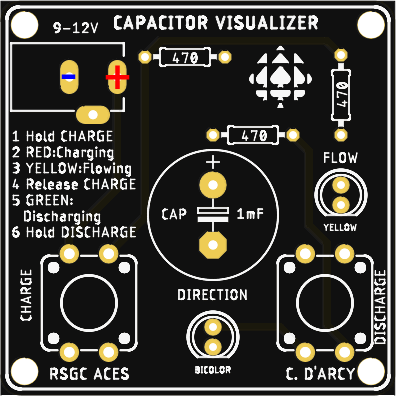 Capacitor Visualizer. 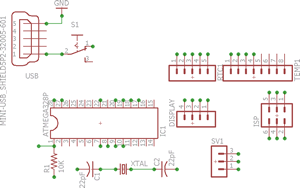 A truly marvelous little circuit emplying a bicolor LED is of great use in explaining in demonstratiing the direction of current in a charging and discharging capacitor. 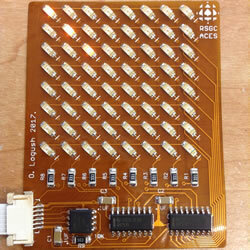 The PCB was used the for first time in the fall of the Grade 10 course and a month later in the Grade 6 Science unit. J. Dolgin designed and fabricated a set of cases for the Grade 6 implementation to give the prototype highly finished appeal. 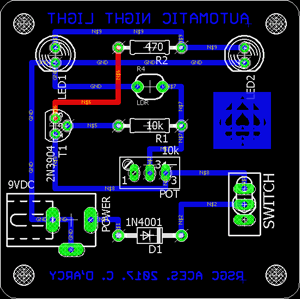 Adapter ISP FFC V2. 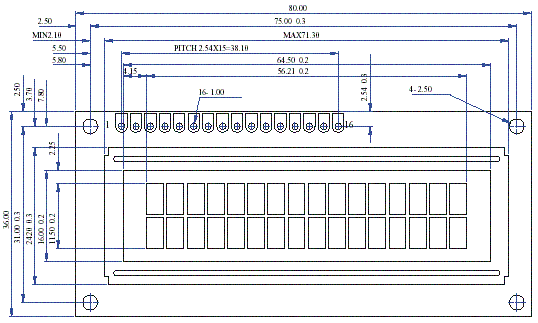 True surface mount devices are flashed through the use of a Flat Flex Cable (FFC) and connector. 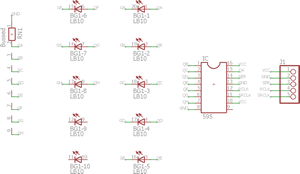 Either your Pocket AVR Programmer (Arduino IDE) or your ATMEL ICE (Atmel Studio) cables will connect to the 6-pin male ISP header on the board (right). Great care must be taken in designing your EAGLE files to ensure the 6 signals are in the correct arrangment as shown. Astable Multivibrator v3. Having finished the first batch of 100, replacement order to Dirty PCBs for 300 slightly modified units was placed in April, 2018. Terminal blocks replaced the two previous LED positions to allow for access to the square wave output. Gecko II. A 2018 upgrade of the classic 2014 model. (Appliance) Grade 11 Matrix Equalizer. 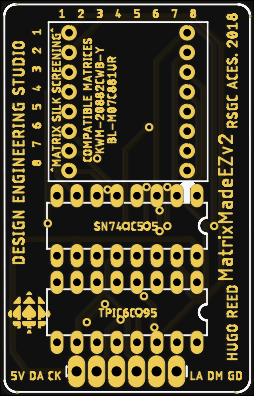 Dirty PCBs was called on to manufacture the boards for the Matrix Equalizer PCBs (developed in January 2018) intended for use for the first time in the 2018-2019 Grade 11 course. Grade 5&10. 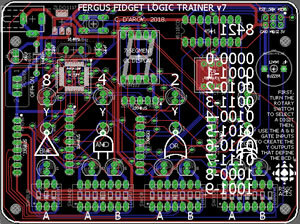 Fergus Fidget Logic Trainer. 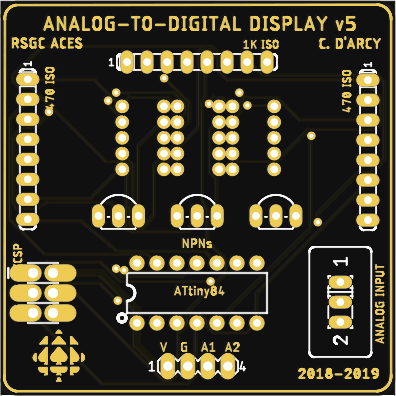 A class set of custom designed digital logic training boards intended for use by Grade 5s and 10s hit the ACES round table in the fall of 2018. It took 7 board revisions to get the board to where I wanted it to be. Nick Woollcombe invested dozens of hours soldering SMD components, assembling, and debugging over 30 units. This is a one-of-a-kind RSGC ACES labour of passion, that those who undertand, can fully appreciate. Grade 5 BCD Decoder. In preparation for the session with the Grade 5s in November 2017, we set out to develop a device that the students could use to associate binary input with decimal output. E. Peterson arranged to have the boards manufactured through Dirty PCBs. Breadboard Power Adapter. 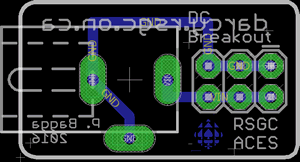 A revision of the his earlier DC Jack adapter by P. Bagga in February 2017 included a 1206 surface mount LED and resistor for power indication. (Appliance) J. Scahffer's Traffic Light. 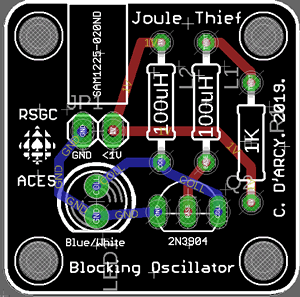 The result of J. Schaffer's introduction to EAGLE in February 2017 yielded this simple, but effective, traffic light circuit board. 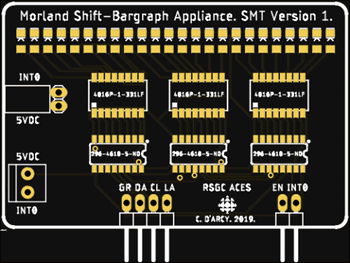 (Appliance) T. Morland's Shift Register-Bargraph v1. 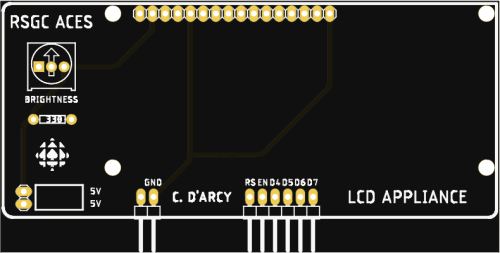 The result of T. Morland's introduction to EAGLE in February 2017 yielded a circuit board that can be used to develop students' facilty in the use of shift regsiters and as a visualization device for a wide range of sensor projects. Flex PCB. 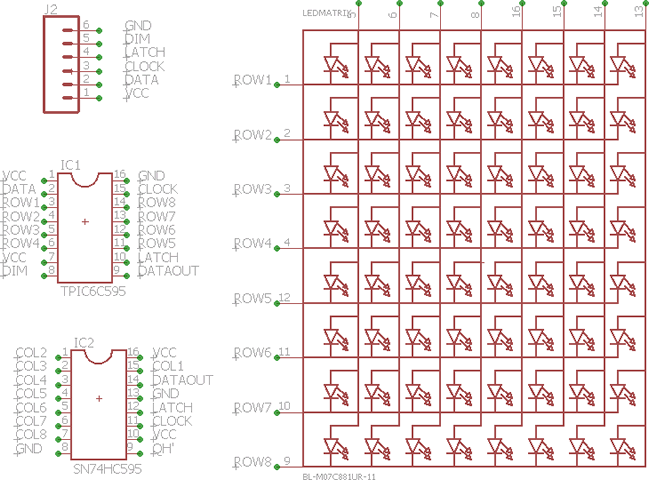 SMD Matrix. 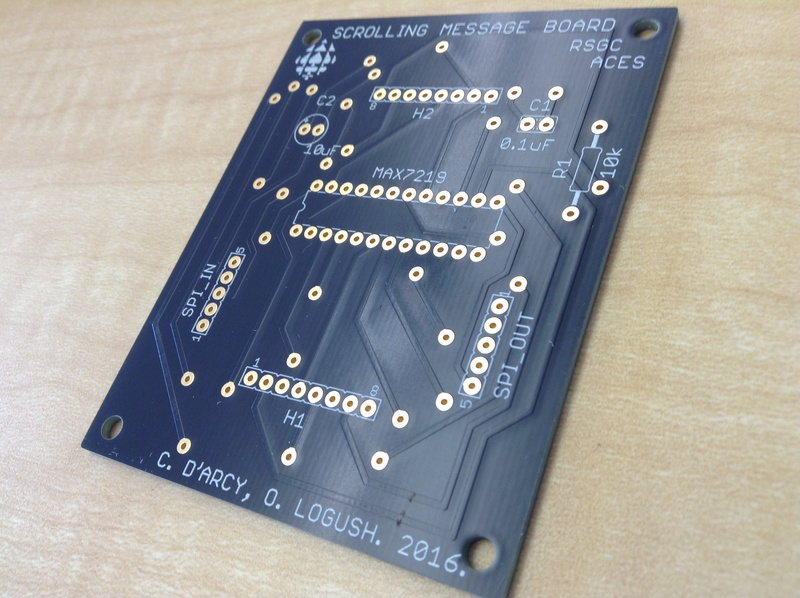 O. Logush (ACES' 18) went all in and designed, ordered, and assembled this 64 LED Matrix flex circuit board. Components were soldered using the DES' Aoyue 968A Hot Air Rework Station. Here's the Flex Matrix in action. 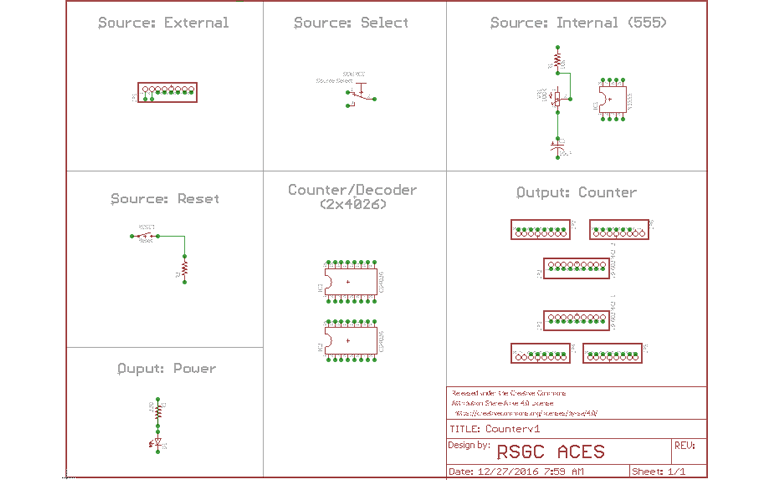 Pulse Counter v1. 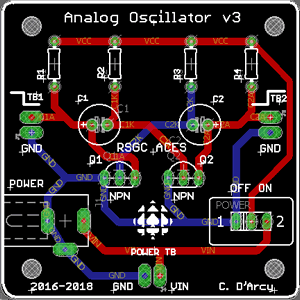 (Dec-Jan 2016-17) Inspired by a need to count pulses from Timer1 Compare Timer Match Mode in Assembly over the 2016-17 Christmas break, I designed the board below. 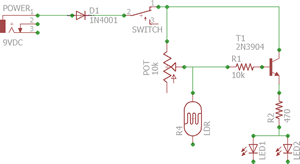 Two switch-selectable sources (external and on-board 555) provide digital pulses to a pair of 4026 counter/decoders. 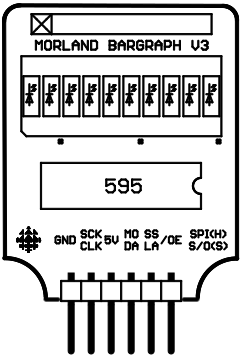 For numeric output, the LB-602MK2 dual 7-segment display block was employed. Design Decisions. The precise dimensions (and hole placement) of the Gecko was retained, in case a front plate was desired for the device. Right angle pin headers in the external source will allow the board to stand upright on a breadboard. 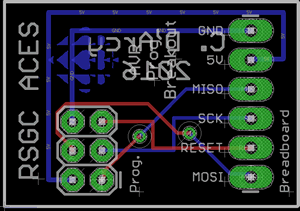 In-System Programmer Breakout Board. 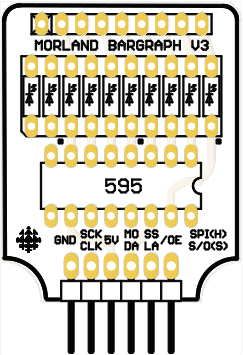 This board is used to flash standalone AVR microcontrollers on a breaboard using our Sparkfun Pocket programmer. Breadboard Power Adapter. Designed by P. Bagga over the Christmas Break 2016/17, these little babies have become quite handy in the DES! 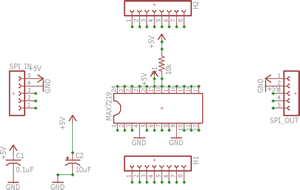 Astable Multivibrator. G. Trusler (RSGC '15) made up a custom batch of these cute little guys for the Fall '14 TEL3Mers. For the Hallowe'en tradition to continue inventory had to be replenished. 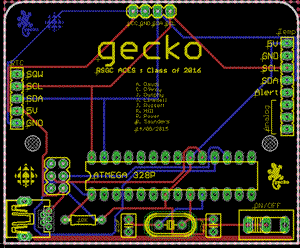 Gecko (Spring 2015). As a legacy project, the 2014-2015 Grade 11 TEI3Mers created this wildly successful clock/calendar. 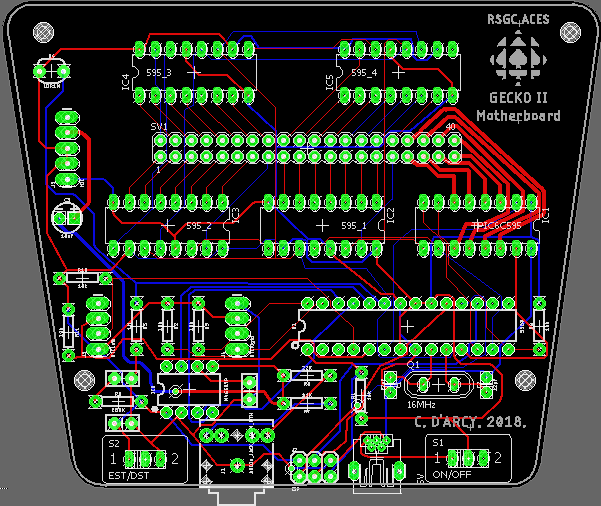 R. Saunders (RSGC '15) did most of the in work whippping the board into shape. Follow the link to learn more about this amazing little device.